COUNT YOUR BLESSINGS is a five piece, youthful, energy packed rock band coming straight out of Maryland with nothing but one thing on their mind, to make honest, hard-hitting songs that you cannot get out of your head. Including members with ages that range from seventeen to twenty-one, it is hard to peal your eyes away from these guys. Their home town following must all agree that their live performances are full of non-stop entertainment and songs that leave you humming. Holding an east-coast tour (blood, sweat, & rheTOURic) and hundreds of shows under their belt, COUNT YOUR BLESSINGS has caused a sensational buzz in and out of their home state. Their debut EP "Our Fear Is Our Glory," is smart, versatile, and loaded with gold-plated harmonies. 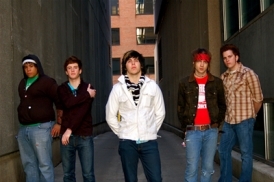 Judson Mattingly (lead vocals), Mikey Green (guitar/vocals), Antonio Rucci (guitar), Ryan Altvater (bass), and Kenny Smith (drums) worked with producer Ron Vento of NightSky Studios (The Pennyroyals, Wakefield, and Downtown Singapore) to solidify the groups unique rock sound. COUNT YOUR BLESSINGS strives to reach out to as many people as possible to get their music heard and will stop at nothing, to be different in a music industry filled with many bands having a cookie-cutter sound, and to do what they love, playing music.